As you can see the different discounts erode the list price from $1699 to $630 pocket price. 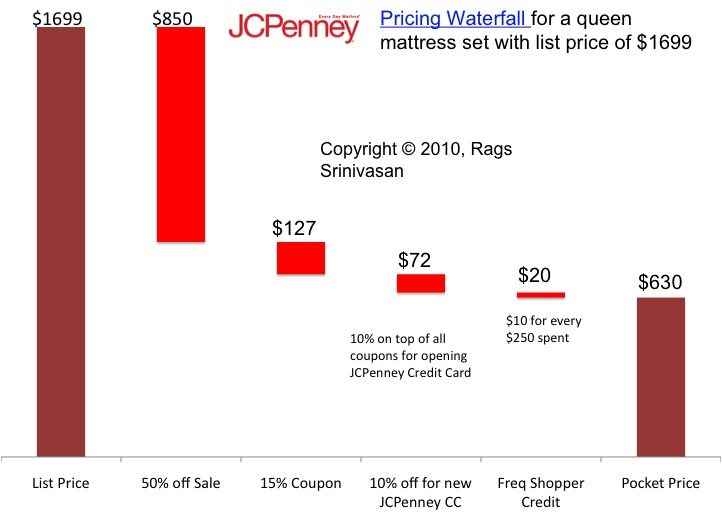 You could go on to say this the reason for all the financial woes of JCPenney but that would be far reaching. “what if a business can claw back just 1% of the price?”. There is a book called the The 1% Windfall that is based just on this theme. You can see the fallacy of such an argument. I think we have been approaching this all wrong, looking at this as price leak that can be addressed. A survey of how many businesses price their products indicates that it is not the leaks we need to worry about it is their complete lack of understanding of value created for the customer. No one seem to bother with customer needs, alternatives available to them, or assign a dollar value to economic value created for the customer. Instead they start with their cost and add on the margin markups. If there are multiple steps in the flow to the customer each stakeholder adds their markup without regard to value they add. While the incumbents are doing it you would expect different behavior from disrupters. But any new entrant -supposedly a disruptor -goes on to follow exactly the same pricing philosophy. WSJ: How did you come up with a price tag for the products? Ms. Goldin: We looked at what other people were doing in water overall and flavored water. We wanted to be priced competitively with those types of flavors and those types of products. We knew that we really wanted to get to a point of having a good margin, and in the beverage industry, having a 50% margin is sort of what you’re shooting for before you sell to distributors and they sell to groceries. Since the way businesses arrived at the prices are all wrong it makes no sense to study the price waterfall which is simply an artifact of the underlying wrong pricing. There is no point in charting the waterfall and trying to plug leaks. Throw away the waterfall chart and instead start with first principles, asking “What job do we want customers to hire the product for? What value it creates? and what should be our fair share of the value created?”. If you didn’t start with customers, it does not matter whether it not the price points are working now or not. If you didn’t start with customers your pricing is wrong.